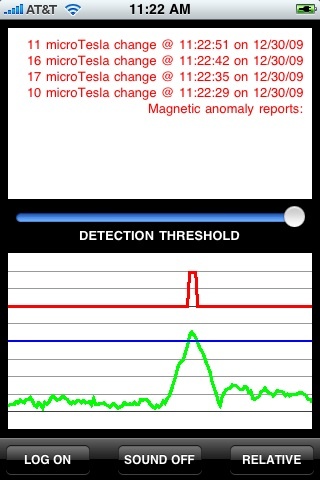 The Magnetic Anomaly Detector (MAD) measures differences in magnetic field strength using the iPhone 3GS magnetometer. Monitor changes in Earth's magnetic field. Drag it across a wall to find nails in studs. Interested in the paranormal or UFOs? 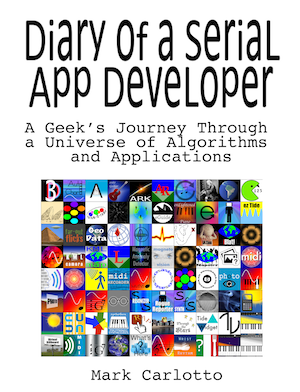 Use it to investigate anomalous phenomena. MAD measures both absolute and relative changes in the magnetic field. Use the "Absolute" setting to detect long term changes, e.g., due to sunspot activity. In "Relative" mode MAD can detect very small changes (1-2 microTeslas). It is sensitive enough to detect a steel paper clip under a phone book! Curious about what happens overnight at home or in some strange place? Plug in your iPhone, turn off auto-lock so your phone stays on, turn on MAD, set your detection threshold, and start the report logger. 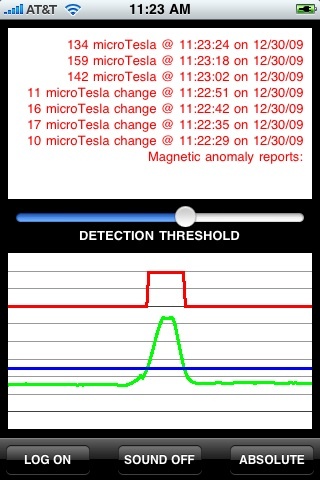 Changes that exceed the detection threshold are recorded and time stamped. To export the report log, copy it and save to notes or email.